Recover & restore tables, queries, forms, macros, reports, etc. Allow users to Export both Structure & data of selected database Items. Repair corrupt MDB file in MS Access 2013, 2010, 2007 & all below versions. The corruption in MDB files due to Trojan infection, virus attack, sudden system shutdown or any error like Jet engine error, "Unrecognized Database Format filename.mdb", "Record(s) cannot be read, no read permission on 'xxxx'" & other Access file errors are possible to deal with MDB repair tool. 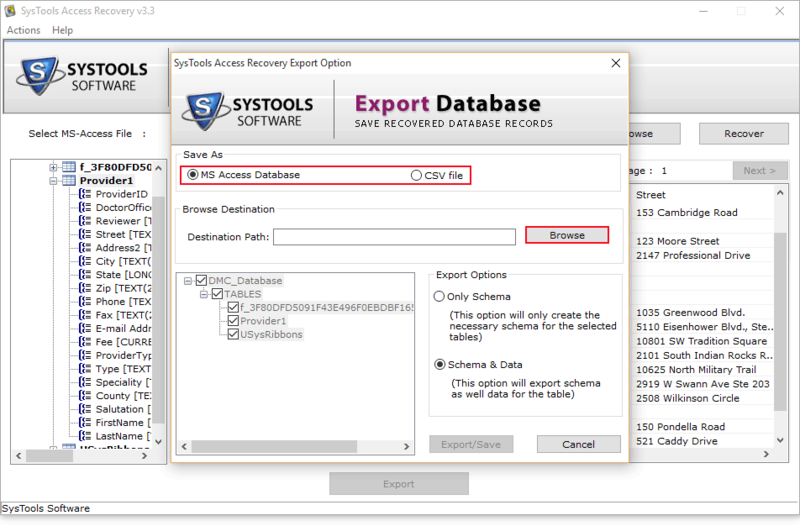 The Export Access Database Tool scans & retrieves MS Access database file. This ACCDB File Repair Tool can restore Queries, Tables, Macros, Forms, Classes & other data from a MDB file. There will be no change or loss of information encountered during the recovery of data from Access database. While scanning & analyzing corrupt MS Access file, the ACCDB Repair Tool shows a real time process. You can see the details of files being processed like: Database name, file storage format & number of tables found in a MDB file. Once the Access data file gets scanned completely, ACCDB file repair utility loads the entire data on its panel. Now, you can select any of the table and preview content in it with associated properties. Also, you can move items in whichever order via arranging the attributes. Save as MS Access Database: This will create an MDB file on exporting the repaired MS Access data. Save as CSV File: You can export the recovered files in a CSV format file accessible on MS Excel. 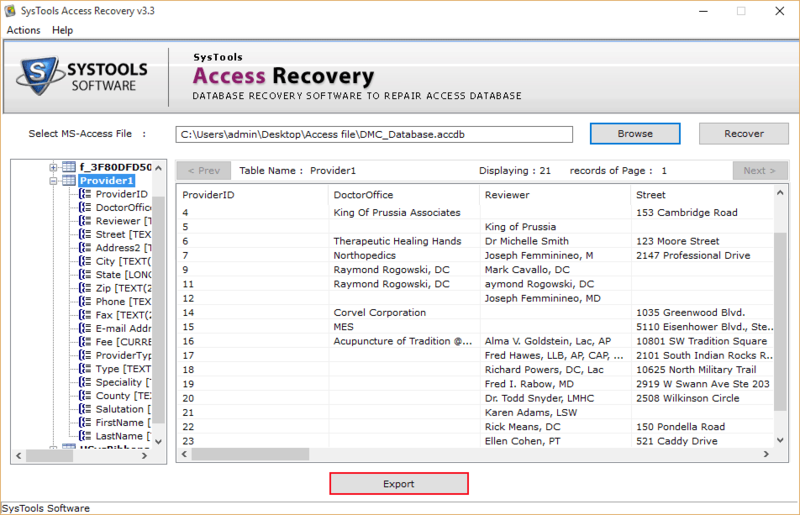 It is possible to save selected tables from an MDB file using this MS Access database recovery software. You can checkmark the desired tables to export them into your local machine. By default, the MDB repair tool will export all database tables & save them at the chosen location. Save With Schema: Create only the schema of each / selected table(s). Save Schema & Data: Save both; the Schema & Data of chosen tables. After you recover corrupt MDB file, using Microsoft Access Database Recovery Tool, you can choose a location of your choice to save the file. Besides this, the MDB Repair utility allows you to create a New Folder on your local machine to save the file inside this. It is possible to make a new folder directly from the software panel. Try the Demo Version to Repair Corrupt MDB File in MS Access Versions 2013, 2010, 2007, 2003 etc. Demo version of Microsoft Access MDB Repair Tool previews all recovered content of corrupt ACCDB/MDB file. Can I repair corrupt Access database file .mdb or .Accdb using this Access Repair Tool? Yes, Software is capable to recover data from corrupted Access database files. After Scan process, preview recovered elements and Click Export to save repaired data in desired formats. Can I recover deleted records in Access database using MDB Repair Software? 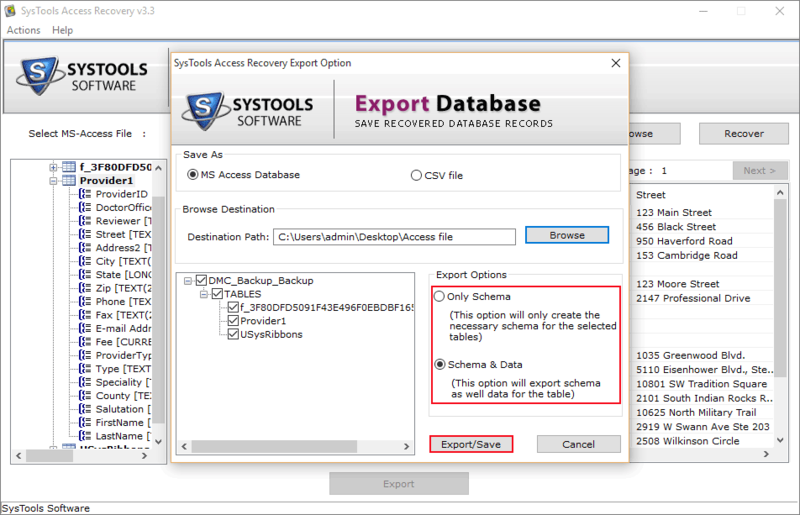 Yes, the Microsoft Access Database Recovery Tool will let you scan corrupt Access file and recover deleted records. Is MS Access installation needed to save recovered database? Yes, it is necessary to have MS Access installed on your machine to run the Access database recovery tool and perform a successful recovery. Does MDB Repair tool support database created on MS Access 2013? Yes, the latest Version of ACCDB/MDB Recovery Software can recover MS Access 2013 database file. Can I also recover corrupt linked tables with ACCDB repair tool? Yes, MDB repair software also recovers corrupt linked tables successfully from MS Access file. Does the tool allow adding multiple Access files for recovery? No, you can only add one MDB or ACCDB file at a time for recovery. Is there a need to rescan file when using full version after trial? Yes, after the successful working of Demo Version you need to rescan your file when using MDB repair tool in full version. There is no such limitation enforced by the ACCDB/MDB repair software. 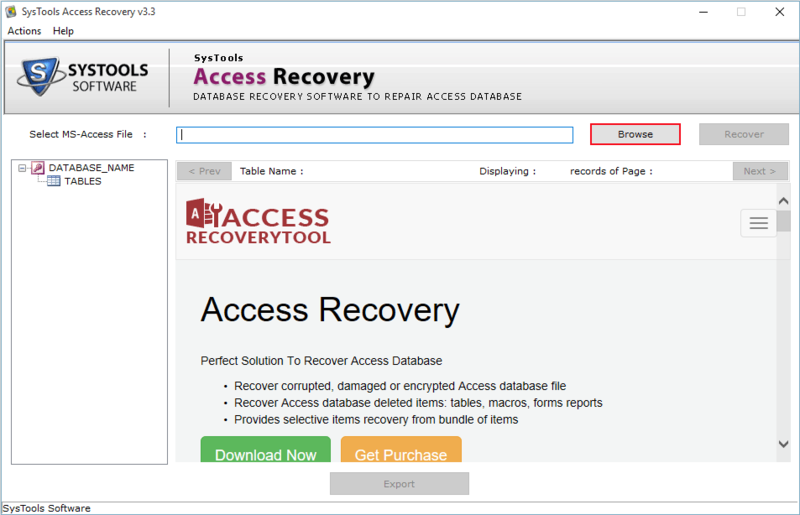 User can recover any size of MS Access database using Access Recovery. Will the software recover a multi-language MS Access database tool? Yes, Access database repair software is featured to understand multiple languages such as: German, Spanish etc., and it can also recover such databases easily. Yes, you can remove all corruption issues like: "Unrecognized database", "The database is in inconsistent state" and many other corruptions easily using this MDB repair tool. Is there a need to install any .net framework to retrieve a corrupt .mdb & .accdb file? No, To retrieve a corrupt .mdb & .accdb file you don’t need to install any .net framework only install Access recovery software. Does Access database recovery software restore all MDB & ACCDB file components? Yes, the MDB repair software supports repairing and retrieving all objects of both MDB and ACCDB files. ACCDB & MDB file revovery tool is best software to retrieve the data. I was unable to restore my deleted MS Access file. I examined a lot and came across this MDB file Repair software. It retrieved my deleted Access database file in just few clicks without altering the original database. We had a collection of Access databases and most of them were above 1.5 GB. This had started to push Access to reaching a state of corruption. 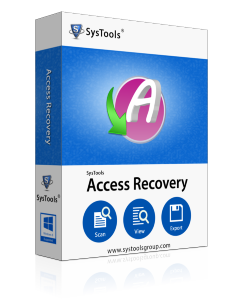 Thankful to SysTools Access Recovery tool that not only helped us to detect the corruption but also resolved it easily. I used MDB Repair Software in my investigation workplace and my seniors additionally appreciated its options and result. Thanks for this software package. This MDB File Recovery Tool made my life so easy. I couldn't find an appropriate software to repair corrupt Access table since long and then I stumbled across this supercool tool and Voila! Many many thanks to the developer team!! I just tried the MDB repair tool full version and got repaired database in access 2010 and 2013 both. Completely satisfied with the results that the tool provided. I would suggest all users to give Access Recovery Tool a try at least once!